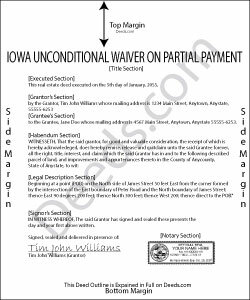 An unconditional waiver is effective when signed and given to the property owner, and waives part of the lien amount representing the partial payment made. Unconditional waivers are effective regardless if payment is actually made. So if accepting a payment via check, only use an unconditional waiver if there are no doubts about whether the check will clear the bank. Erika H. said: The service was fast and efficient. So glad I stumbled upon this website!